Before and after shots: Here is a great example of what PDC can do for the aesthetics of your property. Fluid spills such as motor oil, gasoline and hydraulic fluids are like products to your asphalt and are able to penetrate the surface and destroy the asphalt binders. If left untreated, the aggregate will ravel leaving the spill location soft and unstable to the point that you can penetrate the surface with a knife. By applying PDC, these areas will stabilize and stop deteriorating. Please contact us at info@pavementdressingconditioner.com for the distributor in your area. "There are numerous methods being employed for asphalt pavement preservation, including rejuvenator emulsions, asphalt emulsion fog seals, a variety of surface treatments (including slurry and micro surfacing technologies), and emerging asphalt thin overlay technologies. These methods range in cost from approximately $0.50 to $2.50 per square yard. 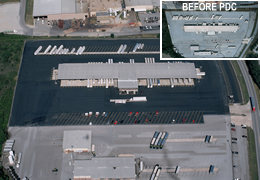 To make the most of maintenance budgets, many agencies have resorted to the use of asphalt rejuvenators." Rejuvenators are more expensive than sealcoating. False. Although the initial application is slightly higher in price because rejuvenators are an oil based product rather than water, most rejuvenators need only be applied every three to seven years, based primarily on traffic volume. Over the next 10 years, a significant amount of money is saved because of the infrequency of the applications, reduced maintenance and by not needing to pay for an overlay when the asphalt starts deteriorating. Rejuvenators take longer to dry and track more. Anyone can put down a rejuvenator. False. Make sure to use a licensed applicator. The equipment used to put down rejuvenators is specially designed for that product. If a contractor says they can put it down with their regular equipment, be very cautious. You only want licensed, experienced contractors working on your property. Rejuvenators are more slippery than sealcoating. False. Sealcoating is more slippery than rejuvenators. Visually, rejuvenators appear to be slick, but because they soak into the asphalt they are skid resistant. Sealcoating can puddle up and fill in the natural peaks and valleys which occur on pavement. Over time, they eventually become flush across the lots, making the hydroplaning easier.